I find it unconscionable that a company can ignore a serious design flaw in a widely used product that has been in production for decades. Namely, the Hy-Gain Tailtwister rotator (T2X). If you have a T2X you have likely encountered this flaw. I'll briefly describe the flaw and how I recovered from one time in an unconventional way. The flaw is simply this: occasionally the rotator locks up, able to turn in one direction but not the other. The usual method of dealing with this is to briefly turn it in the operational direction, after which it will once again turn in both directions. It is annoying but not a deal breaker. Since the T2X tends to be reasonably priced on the used market the flaw elicits grumbles but rarely more. I got mine for a good price and overhauled it. I would never buy a new T2X since it is extravagantly overpriced for its features, load ratings and quality. The manufacturer gets away with it since hams keep buying them despite poor reviews and continuing problems. None of this is the direct fault of the current owner of the product line -- MFJ -- since the T2X and its woes go farther back decades. They just keep churning them out to feed the market's appetite. Obviously I decided to accept the good and the bad with this rotator. Although the picture at right looks perfectly innocent it is not. The antennas are pointed south and, at the time, were not able to point elsewhere. This is the case where the flaw is far more than an occasional annoyance. When the rotator locks at the clockwise or counterclockwise stop you cannot use the trick to briefly turn it in the operational direction since it stopped in that direction by the limit switches that prevent over-rotation. Often the only solution is to climb the tower. A helper in the shack releases the brake and you grab a yagi boom and manually jiggle the mast to free the brake. Since this is not a desirable thing to do one tries to avoid the situation by being careful to never let the T2X rotate right up against the stops. In the heat of an opening or contest it is easy to forget. Other times wind and rotational momentum will put the rotator into the danger zone despite your best intentions. In this instance I was chasing South American DX on 6 meters and was trying to catch a new one before the fickle propagation could turn against me. My full attention was not on the rotator position. After trying (and failing) to work the DX I discovered that the rotator was locked against the south stop. Until I could unlock the rotator there would be no west coast or European openings for me! I was not pleased. Over the next few hours I would try the rotator, hoping for a miracle. Absent a miracle help was arranged for ground assistance, but not for that day. Meanwhile I fretted. At least the HF bands were available to me with my other antennas and tower. Later that day a weather front moved through and moderate winds of up to 50 kph were with us for a few hours. 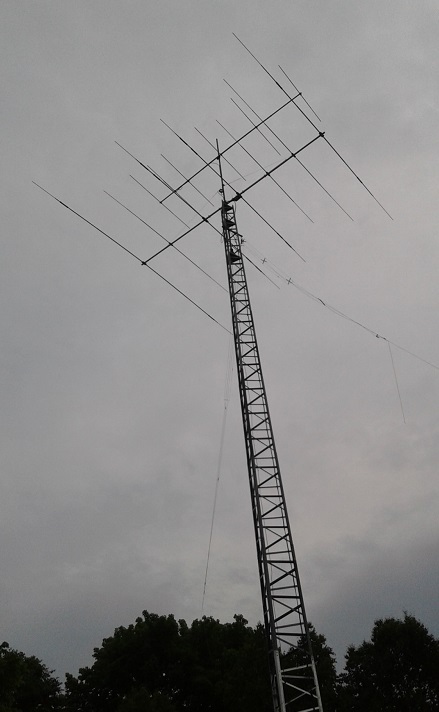 I noticed the antennas rocking on the mast as they usually do with Hy-Gain rotators. This due to the play of the brake wedge in the teeth of the outer housing. As I watched I got an idea. Back in the shack I released the brake and waited a few seconds. I tried turning the rotator. It didn't move. After a brief pause I tried again and this time the rotator resumed working as it should. What I was trying to do, and succeeded at, was letting the small and random rotation due to the wind force do the mast jiggling for me without having to climb the tower. I had never tried this before and was pleased to see that it could work. With the antennas back towards Europe I phoned to inform my helper that the problem was resolved. He had a good laugh when I related what I'd done. In future I'll have to be more cautious when operating the rotator. If you have a T2X or are considering one perhaps my story will someday be of use to you.